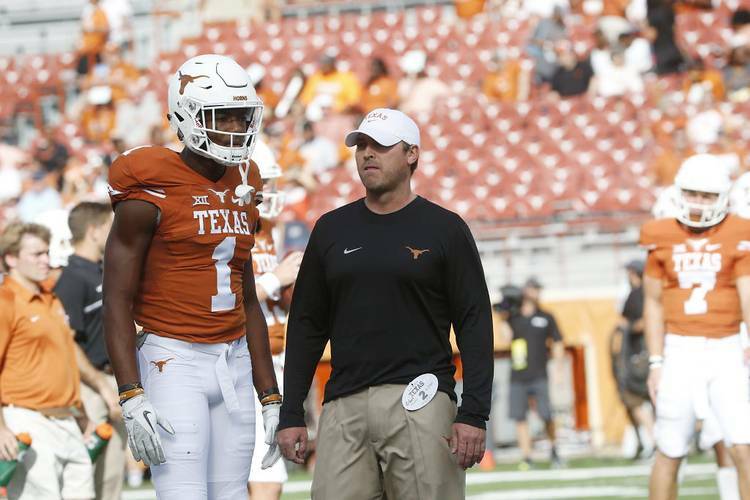 Sterlin Gilbert, who directed a successful offense at Texas for one season, has reportedly been hired to lead the football program at McNeese State. FootballScoop.com reported on Wednesday that Gilbert will be McNeese State’s next coach. The website cited unnamed sources in its story. It also reported that Gilbert was a candidate for the vacancy at Texas State, which was ultimately filled by West Virginia assistant coach Jake Spavital. At McNeese State, Gilbert will inherit a FCS-level program that went 6-5 in 2018. Gilbert, who has never before been a head coach in college, is a branch on Art Briles’ coaching tree. Gilbert spent one season as UT’s offensive coordinator. During the fall of 2016, Texas averaged 31.9 points per game and D’Onta Foreman became the school’s second-ever 2,000-yard rusher. After Charlie Strong was fired following the 2016 season, Gilbert followed him to South Florida. Next story: The Whys of Texas: If everyone had stayed, would the Longhorns be in this year’s CFP?